On Saturday 22 June 2013 come on an exciting cycling event taking place across the whole of Lambeth. Bike the Borough is a series of cycle rides around Lambeth setting off from four parks: Archbishop's Park, Clapham Common, Streatham Common and Brockwell Park (see map right). 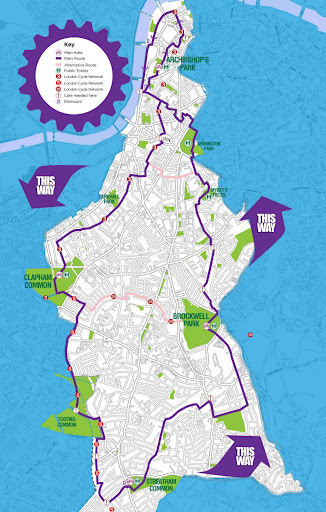 Participants can either cycle around the four routes setting off at their own pace or can take part in organised rides leaving on the hour between 11am and 2pm. Pick up a passport at one of the hubs, Archbishop's Park, Clapham Common, Streatham Common or Brockwell Park and cycle as much of the 18.5 mile dedicated route as you like collecting stamps at each of the hubs. Collect two stamps or more on your passport and you'll be entered into a draw to win a bike. Look out for the landmarks on your passport - if you can identify them you will go into a separate prize draw to win a bike! Each hub has something fun to do whilst you give your legs a rest, be it massages, face painting, yoga-for-cyclists or live music at Clapham Common. The route will be signed and there will be marshals around the route to help keep you on track. Led rides will be leaving the hubs every hour starting at 11am, the last led ride will leave at 2pm completing the last leg of the route from each park. Dr Bikes will be on hand to check that your bike is in tip top condition. There will also be a 'Little Legs' children's ride leaving Brockwell Park at 11am - so come early to get your face painted!